Sports games have had a hard time keeping up with other genres in terms of quality. These days, you’ll find games with a little bit of polish, but the biggest, most in-depth titles are generally freemium games. That is disappointing. The sports games genre still has a lot of growing to do, even in 2017. Despite a relatively weak selection, there are some decent games in the sports genre. We tried to include as many pay-once games as we possibly could. You can also search yourself in Google Play. Some games have great graphics. However, the freemium style makes then difficult to truly enjoy. Anyway, let’s take a look at the best sports games for Android! Here are some other sports related lists that you might like! FIE Swordplay is one of the surprisingly popular sports games. This one involves fencing. You pick a weapon, fine tune your gear, and fight opponents. The game features real fencing techniques, good looking graphics, easy controls, online PvP, a story mode, and official support from the International Fencing Federation. This one also isn't a freemium game. That makes it a natural choice for this list. Fencing isn't the most popular sport, but this is definitely a great sports game. FIFA Soccer is the latest game in the FIFA franchise. It's also one of the most popular sports games. It features full rosters of over 550 real teams. That includes past and present stars. The game also include some of the best graphics in a mobile game that we've seen. It is an EA game. Thus, you should prepare for all of the freemium stuff. Don't expect a completely perfect game, but it is definitely above average. Plus, it gets yearly refreshes with things like roster updates and occasionally even some mechanic changes. Hockey Nations 18 is the best hockey game on mobile. However, there aren't a ton of hockey games on mobile and, overall, this is a fairly average title. The game has a lot of play modes, including live games, three-on-three, playoffs, and outdoor games. The actual game play is a little too fast, but otherwise fine. The game includes 80 teams, seven tournaments, and simple controls. Unfortunately, the controls did lag a bit during our testing. There are definitely some bugs that need worked out and some tweaks made. However, it's a consistent series of hockey games with regular yearly updates. Ketchapp is another developer studio with a few good sports games. They include games for basketball, tennis, soccer, summer sports, and winter sports. The summer and winter sports games have a variety of mini-games that you play through. These are simple, arcade titles. For instance, the basketball game by Ketchapp is just shooting a ball into a hoop. You won't get amazing graphics or deep game play. However, they do fairly well as time killers and they're kid friendly as well. They are also relatively inexpensive. In fact, many are completely free with just some advertising. Hit the button above to check out their developer page. Madden NFL Football is the most popular football game on mobile. It features decent graphics, simple game play, up-to-date rosters, and more. The game also has weekly tournaments. Unfortunately, this is mostly a simulation game. You take over a team and add players to the roster. Players level up and improve in various ways. It's yet another EA Sports freemium game. Unfortunately, in this space, EA simply pays more attention than other big name developers. The freemium elements are very heavy. However, the game does get yearly refreshes and some feature updates. We have some more sports stuff here too! 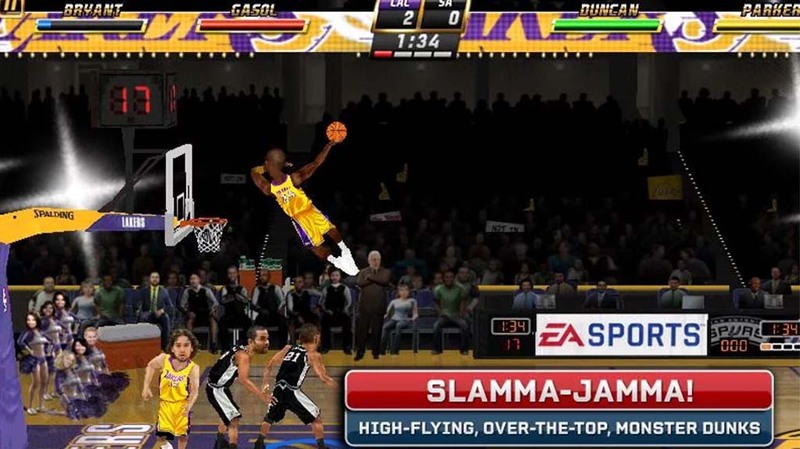 NBA Jam is what it looks like when EA Sports makes a good game for once. This is an arcade basketball game. Players go at it two versus two. The game play includes relaxed rules, optional online or local multiplayer, hardware controller support, and even support for Android TV. It's a port of the arcade game from the 1990's. However, it's still better than all but a few sports games. It's $4.99 up front with no ads or additional in-app purchases. This is easily the best basketball game on mobile and definitely among the best sports games. NBA Live Mobile is actually a fairly decent basketball game. It has that popular mix of simulation and actual sports game. Players construct teams and then play it out against one another. This one has simple controls, decent graphics, The game lets you build your own team. It also lets you play with that team on the court. It is predominately online PvP. There are also a few decent game modes. It's a freemium game and a rather aggressive one. That should be expected with EA games. This is a more realistic game than NBA Jam. However, we like the overall experience with NBA Jam a little more. You can also try NBA 2K18. It's a slightly more premium basketball experience from 2K Games. OK Golf is one of the newer sports games. This is an ode to the arcade golf games of the past. You drag back and release to shoot the ball. It operates on a simplicity perspective. There are no clubs to choose from or things to tinker with. The game is just a nice relaxing game of golf. It comes with a few courses, decent graphics, and some secret stuff to find on your own. It's a pay-once game with no additional ads or in-app purchases. PES 2018 is the newest soccer game on mobile. It's also the only real competitor to EA's FIFA franchise. It features a lot of the same game play elements. You craft a team from existing players, actually play soccer, and build your dynasty from there. It has a bunch of real players from a bunch of real teams as well. That is always a plus and the game has teams from all over the world. The controls are simple and the graphics are decent. Additionally, it's just a tad less aggressive on its freemium offerings than FIFA. You can play either one. They're both decent sports games. This one also gets yearly refreshes for things like rosters, new players, and other such things. Rapala Fishing is one of a few reasonably competent fishing games. We chose this one because it's a little less aggressive with its freemium strategy than its competitors. The game features various fishing locations, easy controls, and daily tournaments. The game boasts no energy bar. That means you can play all day if you want to. We appreciated that. Otherwise, the graphics are decent and there isn't much to complain about. The game gets boring over time, but what game doesn't. FishingStrike from Netmarble is a newer fishing game from 2018 that is also surprisingly good. In fact, it may overtake Rapala on this list eventually. We're almost done! Here are some more potentially relevant app and game lists! RBI Baseball 18 is the latest game in MLB's official mobile game franchise. This one has many improvements over the older titles along with a cheaper price tag. It features official rosters and teams along with a season mode, the playoffs, and decent recreations of all 30 MLB ballparks. It also includes some legendary players for nostalgic value. This is a pay-once title and a rarity in the sports games space. We wish the NBA, NHL, and NFL did stuff like this. The game does have its issues, but nothing so bad that it makes the game unplayable for most folks. We have no reason to believe that RBI Baseball 19 won't be even better next year as well. Maple Media is yet another developer on Google Play with decent sports games. These developers focus more on extreme sports like snowboarding, skateboarding, and they even have a hockey fighting game. Skateboard Party and Snowboard Party are Maple Media's marquee franchises. Skateboard Party plays fairly close to how Tony Hawk did on old consoles. There are a variety of tricks, a create-a-skater mode, and a story mode to play through. The latest in the series, Skateboard Party 3, also includes controller support and customizable controls. Snowboard Party is much the same except it's snowboards instead of skateboards. We're also big fans of Mike V: Skateboard Party. These are definitely among the best skateboard and snowboard games on Google Play. Stick Sports is a developer on Google Play. They make some decent and niche sports games. Their collection includes games for cricket, tennis, and soccer. They don't have the most impressive graphics. However, they are easy to play, kill time effectively, and they're generally fun. They are all freemium games as far as we can tell. Each game has its own set of features and mechanics, but they all share a common feel about them. They're free to download at least. True Skate is one of the most popular skateboarding games. It uses your fingers to control the board. Thus, you swipe your fingers around to do various tricks. The graphics are decent and the controls are really fun. Some other game features include slow motion and rewind functions, replays, and various challenges. It's not a freemium game. However, the DLC strategy is fairly aggressive. The base game comes with one skate park. The in-app purchases unlock other parks, missions, customizations, and other stuff. Touchgrind 2 is another decent game in this genre. Nyjah Huston: Skate Life is another newer entrant into skateboarding games. World of Tennis: Roaring '20s is a surprisingly popular tennis game. It's also fairly new. You start your career as a new tennis player. There is a career mode as well as an online multiplayer mode. Players can improve their player's stats, train the AI to play like them, and unlock a ton of customizations. It's all wrapped up in a charming 1920's aesthetic. Of course, you do get the occasional events and such to keep the game interesting over time. There are some balancing issues and the occasional game play bug that frustrates players. However, it is otherwise a good experience. Thank you for reading! Here are some final sports lists you might like! If we missed any of the best sports games for Android, tell us about them in the comments! You can also click here to check out our latest Android app and game lists!